Resawing is certainly one of those gateway skills that allows the woodworker to utilize wood more artfully and efficiently. It’s not hard to do. Well, let me qualify that. I acquired my Tage Frid style Danish bow saw over 25 years ago and I’ve jointed, set, and filed the teeth over the years so the saw cuts to my liking. Though it is a versatile tool, I currently do not use it very much. It performs well for resawing smaller boards as long as I’m patient and don’t mind some sweat. 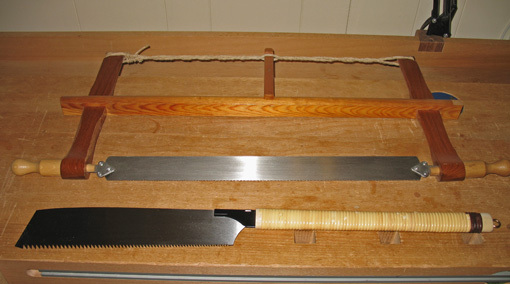 The 12 inch Japanese rip saw, with fearsome looking teeth, especially at the toe end, also does a nice job on smaller boards. My previous small Inca bandsaw also served well but was limited by its 6 inch cutting height and lightweight power. 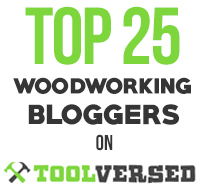 None of these tools made me eager to resaw. Since I upgraded to the Minimax E16 with a 12″ cutting height and 2.4 HP in the tank, it is so easy to resaw that I find excuses to do it. 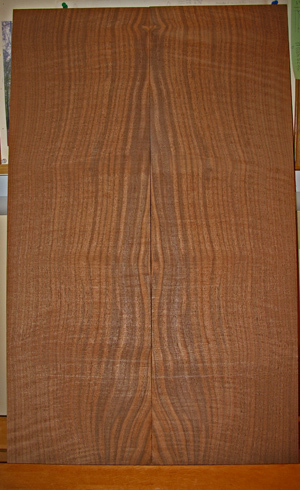 The 10″ wide (each piece, 20″ total), 34″ long curly western walnut in the photo is straight from the saw and will require little surface clean up. I use a 3/4″ x 0.25″ VPC silicon steel Timberwolf blade from Suffolk Machinery. VPC means “variable positive claw” which is their term for modified hook teeth in a variable pitch pattern, 2-3 teeth/inch. 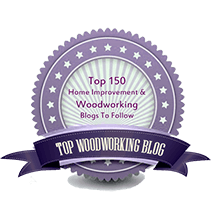 The kerf is about 3/64″. A carbide tip blade is on my wish list but the VPC is darn good at a small fraction of the cost. The E16, lighter and less expensive than the MM16, works into my small shop nicely and so far I have not had any problems with its power. So there’s my resawing history and current set up. More to come on this topic. Rob, I am in the market for a new bandsaw and was interested in your thoughts on the MM E16 now that you have had some time to get it dirty. What do you like about the machine? Anything you dislike about the machine? How is the blade change? Have you had any problems? Thanks for the input, there isn’t too much information on the saw that I can find other than from the manufacturers. Thanks for the inquiry. I’m going to post an evaluation of the E16 very soon. 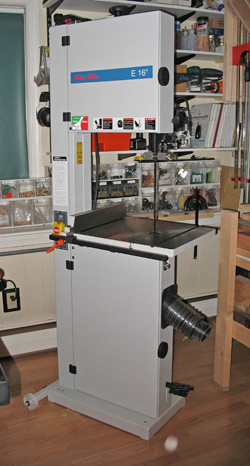 In summary, I like it and recommend it if that’s the size bandsaw that you’re looking for.